Count the day lost if you do not learn something new every day! Today is a good day... because, by chance, a show on local TV featured an interview with one of the 3 Demers brothers who hail from Thetford mines, a small town in southern Quebec (Canada.) With a population less than 30 thousand, you wouldn't expect it to be the home of one of the finest private car collections on the planet, BUT IT IS! It is such a fine collection that the Sultan of Brunei is expected to make a visit in January to take a look a what they've got. This is the same Sultan who possesses another of the finest private car collections on the planet. 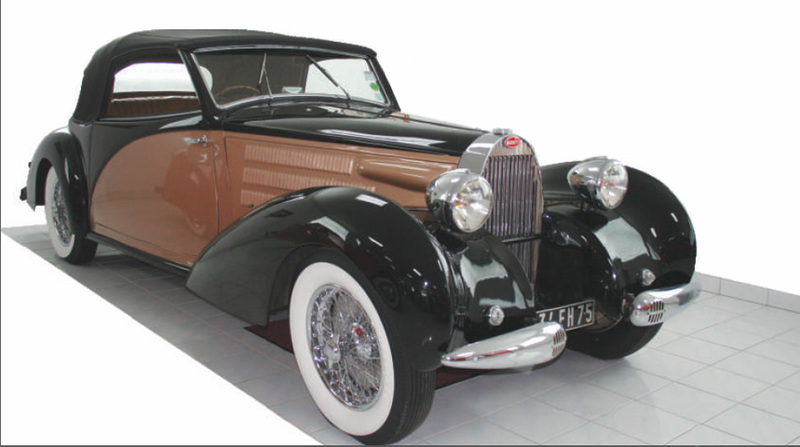 Brothers Roger, Michel and Serge Demers are third generation car collectors; their father and grandfather bought cars and stored them to the point that the collection has reached 500. You can't go see these cars, it's by invitation only. And you can't take pictures either. Occasionally a few are brought out for exhibition and photos go public. 3 are included here as car-brain candy. Enjoy. For years the family negotiated with the city of Thetford Mines and nothing was ever settled. Consequently, they are entertaining locating the collection elsewhere. We'll follow this fascinating little bit of news and if they build a museum, we'll let you know where it is, so you can plan a visit. I'm hoping Quebec City (already a world heritage site) is the place it finds a permanent home. When the "New Beetle" made its comeback in 1998, it was at the top of a nostalgia chain and an absolute hit for the generation that had driven air-cooled "bugs" across all geographies and through all seasons. It was easy on gas, super-reliable and could be painted with flowers to look really cool. What? The "New Beetle" found a willing consumer heavily skewed towards women - intentional or not. Can't say it was meant to be cute because the very first iteration (circa 1949 - 2 were sold that year) in North America was considered downright ugly and sounded like a large lawnmower. Besides, American cars were big and powerful and the VW bug was small and had as much horsepower as a giant lawnmower. However it went from scorn to cultural icon in the 1970s, and it does retain special status as the best-selling car of all time. 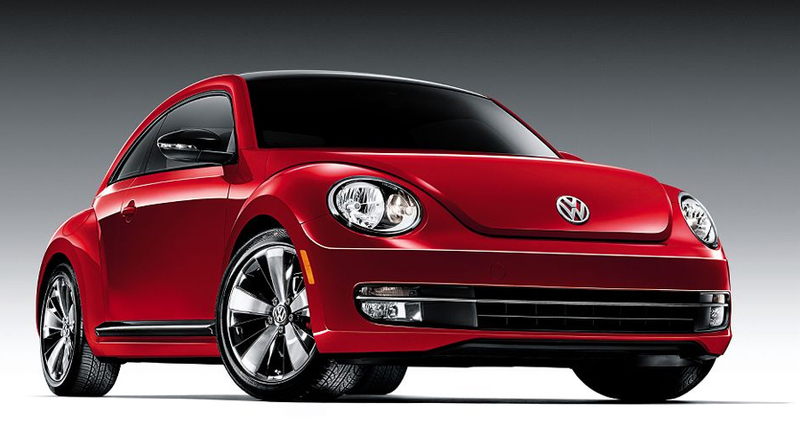 The 2011 "Beetle" was totally made over inside and out. See an interview with VW designers Marco Pavone & Jan Haacke here. This version of the Beetle has a 2 litre turbo under the hood (oh yeah - the engine used to be in the rear.) Find a do-it-yourself plug and play chip tuning upgrade that will pump the horsepower up from 200 to 250 on the same page as what LLTeK offers from the mind of designer Jochen Eckelt - see pictures and pricing of simple body kit styling for the 2012 Beetle here. Last year, the Mercedes-Benz Formula 1 car driven by Juan Manuel Fangio (W-196R) was sold at auction for the fantastic sum of $29,650,095.00 - thats almost 30 BIG ONES! It's not the record though; that belongs to a 1963 Ferrari 250 GTO. You could probably purchase this year's alottment of Audi RS7's in North America for that amount of money, fer cryin' out loud. Availability, authenticity, rarity and history will decide what any one very wealthy individual is willing to pay, but surely, possessing a unique (aka only one on the planet) object can help explain the big numbers when stuff goes to auction. 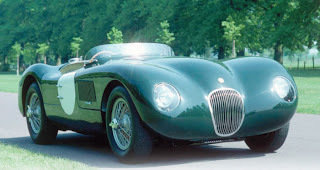 So it is with the W196 that sold at Goodwood, it is the only version of the racer in private hands. The owner might as well be Tony Stark, and who can blame the real owner for wanting anonimity and protecting his/her privacy. Who wants to bet that Pepper Potts bought the car? Switch speeds for a second now and take a look at the Warhol silkscreen (commissioned by Mercedes) up above. 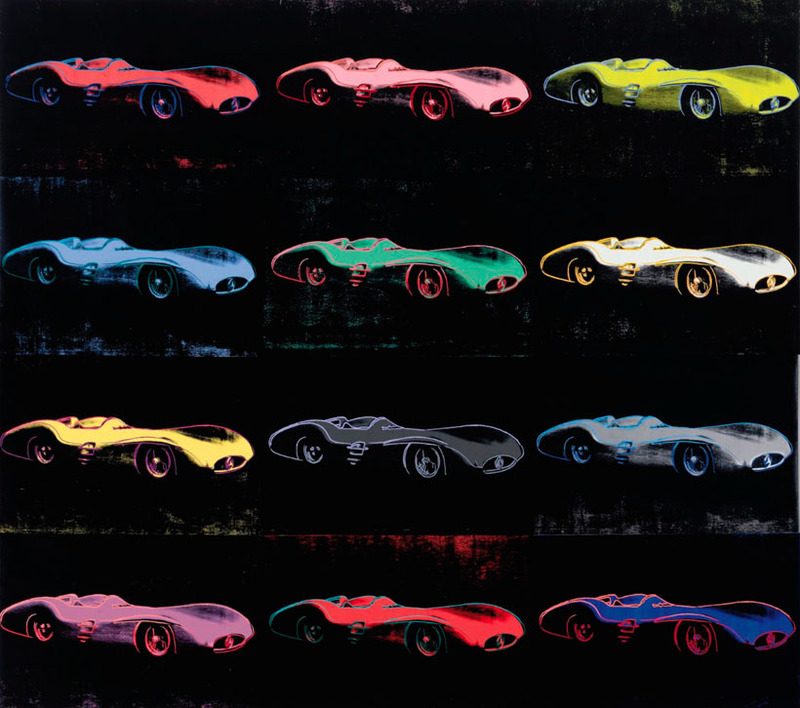 This piece of art sold two weeks ago at auction for $13,045,00.00 - it is entitled "Mercedes-Benz W196R Grand Prix Car (Steamlined Version,1954)". It measures about 13' x 15' and like the entirely real racing car - it is rare. 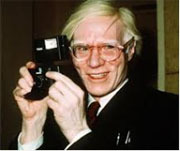 Andy Warhol passed away before the project was completed. So there you have it - a piece of art that, in the simplest of terms, was sold for $450.00 per square inch tells us nothing about why we want beautiful unique things. Give me an RS7 and I'll tell you why in about 3.7 seconds. Trying to find some interesting gift ideas for the guy that drives an Audi? Found it on the intertoobz... The images below are just a sampling of what they're offering. The link to the gift section of the site "Cool Hunting" can be found here. Take a look around if you've got a minute - the site is all about design - pop culture - interesting stuff. 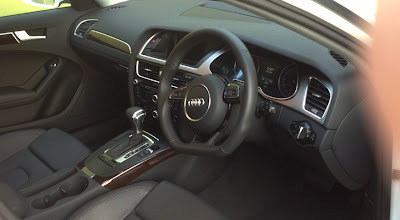 They even have a review on the RS7. Enjoy! Buying or selling for yourself can be a bumpy road. If you're selling your car, the only really important rule to state here is: DO NOT SELL YOUR CAR TO A RELATIVE - EVER - NOT EVEN A DISTANT RELATIVE. NOT even if the car is a winter beater that you're gonna take a loss on because your sister's husband's nephew needed transport and you wanted to do him a favor - forget it. If you're foolish enough to be reminded (for the rest of your life) about the piece of cr@p little Jimmy forgot to put oil in, you deserve whatever you get. Give the car away! and then only with six pages of disclaimers in dense legalese because it may be the only way you won't suffer recriminating looks at all future family gatherings. 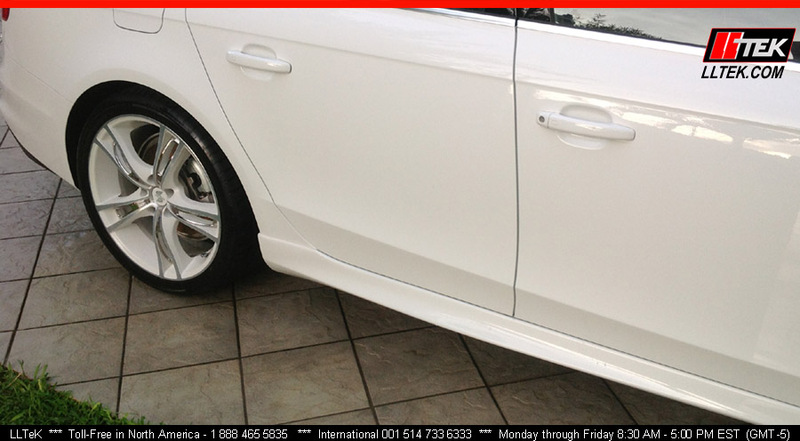 If you are buying a car and you want to put in the time to save some cash - a private sale is the only way to go. Decide what vehicle you want with the budget you have and check the listings every day. Your car will come up sooner or later and all your efforts will be made worthwhile. Ideally, you will be purchasing the car from an older couple who live in a nice burb and who will soon be moving to Arizona. Do not let your enthusiasm for that 2 year old Audi A3 at an incredible price get the better of you. EVER! 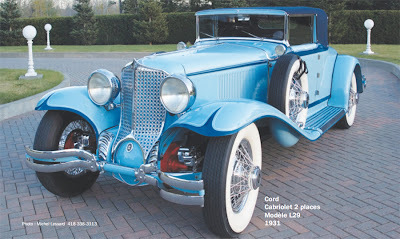 CHECK OUT THE HISTORY OF THAT CAR! Now it's easier than ever to run a history on a car. We don't know anybody in this company; we're not being compensated in any way for mentioning this company - but what a great tool when you're kicking some tires and you know that if you don't close the deal - somebody may pull up and scoop that little bundle of road joy right out from under you. 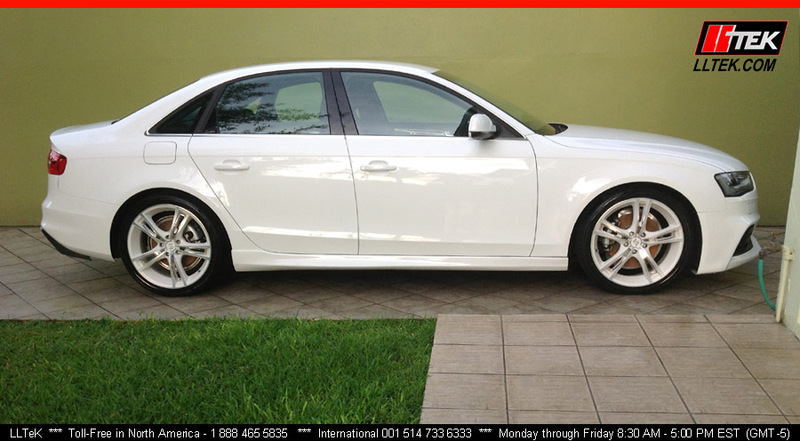 2013 Audi A4 B8 Images in from Trinidad today. It's a right hand drive! Our thanks to Brad for sending these project pix along. 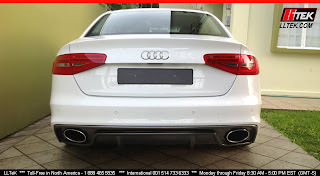 From Trinidad & Tobago: This must be the best-looking Audi A4 B8 on the island. Without stretching, it may very well be the best in the Caribbean (all the dutch boys in Aruba are going to be jealous.) The body kit conversion is out of Germany, manufactured by Rieger; and Brad opted for the wise choice of German parts for his German car. 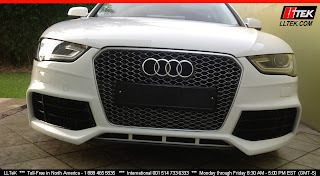 Bumper, grille, corner intake grilles, skirts, and Rieger's exclusive carbon look rear insert with custom stainless tips put the car in hyper-drive. The wheels are brand spanking new also. The white-on-white with stainless steel accents come via eta beta. The wheels are Italian - designed in Italy - manufactured in Italy. No substitutes - no reasonable facsimiles - all top drawer modifications. 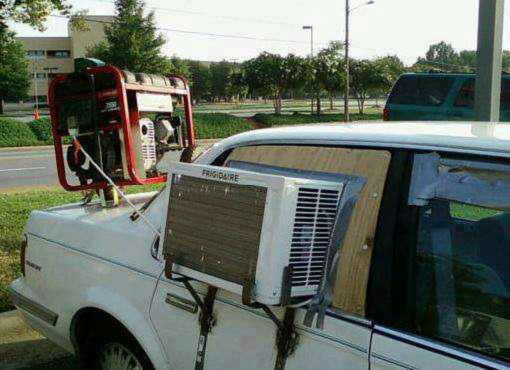 You can bet on a good sound system and what would life be like in hot climes without air? Well done? Yes, but more likely and to the point - just like the car - hot hot hot! Impeccable. 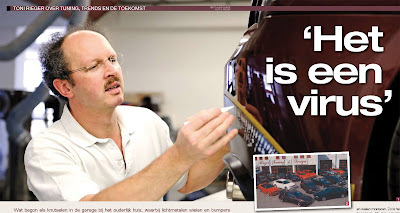 LLTeK has been importing Rieger parts for Audi since 1996, and yesterday I was lucky enough to stumble across a Dutch tuner's magazine (auto & tuning) that featured an interview with Toni Rieger - owner, founder and driving force (no pun intended) behind Rieger Tuning. He's a talented businessman and designer who got to where he is because of a passion for cars (in Bavaria I think that means BMW); but these days it's all the big German names plus a bit of Ford and Fiat. He is a "self-taught" tuner from the school of "Necessity is the mother of invention." He grew up on his parents' farm with four brothers and a sister. He is unassuming and avoids the spotlight. His first car was a wrecked 40hp Polo. He repaired and sold it to get a second with 50hp. His third car was a Golf GTI. His work ethic is fully functional - in the office in the morning and then out on the factory floor in overalls. He employs almost 50 individuals on a campus with buildings occupying some 65,000 sq. ft.
For his 50th birthday he bought himself an Audi R8. He doesn't believe in outsourcing to China. In 2007 alone, eighty lawsuits were launched against counterfeiters cloning his designs. American knock-offs are currently in his sights. He doesn't think electric cars are very efficient - (I think he's being polite here). Every body kit / spoiler produced by Rieger is fit to a car the company buys and tested. He drives every modification package he produces in order to "feel" what the customer will get. There are currently some 40 cars in the Rieger showroom. When he was a kid and starting out, he would store wheels in his bedroom. He purchases a new pair of shoes at the outset of the trade show season. He likes running shoes and his work is the feature - not a bug. I've never met Herr Rieger, never even spoken to him over the phone, but the more I hear about this guy - the more I like him. Maybe the next time I'm in Germany, I'll make an effort to get to Eggenfeld and see if I can get an interview. Special DTM Edition of the Audi A5 in Misano red - Get the V6T. Audi will start taking orders next week for a limited series A5 in recognition of eight wins in the DTM race series - Deutsche Tourenwagen Masters (or in English "German Touring Car Masters".) Bearing the moniker Rocky, it is the nickname for Mike Rockenfeller, who as Audi's DTM racer, just took home his first DTM champion's title. 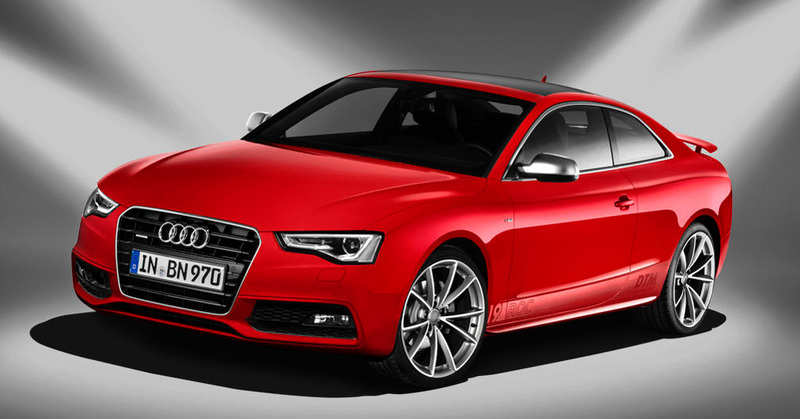 The car will sell at a premium with 20" alu wheels, badging everywhere and a fixed wing trunk spoiler. 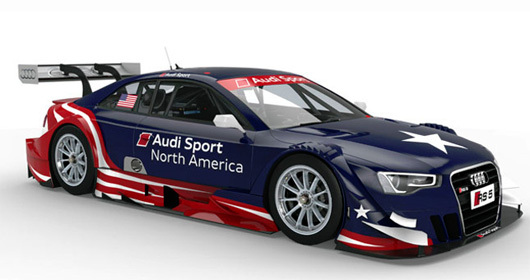 There is no guarantee the machine will be available in North America; however, in related DTM news, there is a rumour that The United Sports Car Racing group could host a DTM event in the US. Keep your fingers crossed because if that happens - you'd get to see the car directly below. Eat your heart out Tony Stark.